A popular Crimean resort of Koktebel is. It is located near the extinct volcano Kara-Dag, and 20 km away from Feodosia. It is believed that this resort founded the artist and poet M. Voloshin. Therefore, in the heart of the village is home of the Poet. 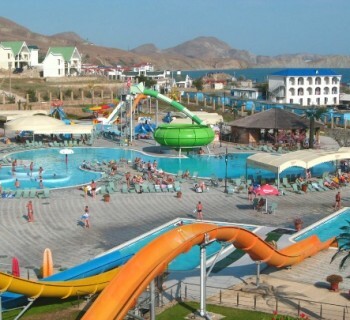 If you are going to rest in the Crimea, you probably care about prices in Koktebel. In Koktebel functioning hotels of different categories. They offer rooms with different levels of comfort. In the hotels of the resort accommodation prices range between $ 20-240 per night per room. The cost of housing depends on the distance to the beach and the season. The village also has hotels open all year round. All places are designed for family and children's rest. Many of them are well-equipped with a parking area and a barbecue area. Usually hotels provide free taxi or shuttle service. Tourists are taken to the airport or at the railway / train station and brought directly to the place of residence. Many people prefer to rent roomshotels with a swimming pool, internet access and children's play areas. Each hotel offers meals in the dining room or cafeteria. Prices for accommodation in the private sector lower hotel prices. The highest price level is observed in July and August. During this period, remove 1-room apartment in a mini-hotel can be for 800-1700 rubles per day. Guest houses, distant from the beach 1000 m, offer room for 700-1400 rubles. At the resort, you can move around on foot, by taxishuttles. Marine taxi runs from the waterfront to the Koktebel Bay Quiet. A ticket for an adult costs about 200 rubles, for children - 140 rubles. The village has a bus on which bus routes go to the other resorts of Crimea. 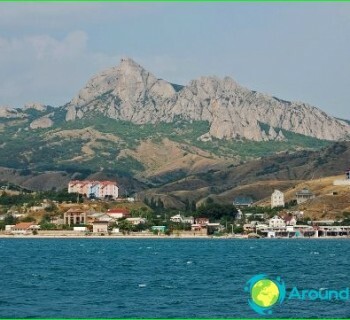 To get to Feodosia is possible for 15 rubles, to Sudak - for 43 rubles. Cost of food is usually included in the pricesightseeing tour or in the room rate at the hotel. Sometimes the hotel is required to take into account only breakfast. At other times, tourists can visit the restaurants and cafes of the village. On the waterfront is concentrated the bulk of the catering establishments. Many cafés offer a set menu at a fixed price. Budgetary considered such establishments as "Fish", "spoon", "Emine". More expensive are the restaurants "Zodiac", "Chinook", "Bear" and others. The cost of food varies from 50 to 500 rubles. Try the local production plant of vintage cognacs and wines can be in restaurants or in the tasting room. Experts believe that the cognac "Kutuzov" with endurance 25 years, the plant produced, superior in quality famous "Napoleon."